San Andreas In 4DX: Is It Worth The Trip? Thanks in large part to the growing popularity of movie and television streaming services online, the movie industry has been on a serious hunt in the last few years trying to find a way to add to the big screen experience. This search has not only resulted in the expansion of formats like 3D and IMAX, but even some stranger innovations as well – like Barco Escape. In recent months, however, a new name has entered the game in the form of 4DX: a special theatrical experience created with the use of moving/shaking chairs and a large variety of environmental effects. But could 4DX really be the wave of the future? I recently had a chance to find out for myself. Two weeks ago, I had the pleasure of taking in my first 4DX experience while viewing the new earthquake disaster movie San Andreas at the Regal Entertainment theater at LA Live in Los Angeles – the only 4DX theater currently in the USA. The screening was filled with some ups and downs, and a balance of positives and negatives, and for your reading pleasure I’ve recounted my experience with the new movie format below. Is it worth the $30 that a 4DX ticket costs? Read on to find out! To put it rather bluntly, the best aspect of 4DX is the simple fact that it really does work well as a unique movie experience that brings you right inside of the action. Doing its best to capitalize on as many senses as it can, all of the equipment was orchestrated to work in tune with San Andreas, and some of the effects were downright impressive. 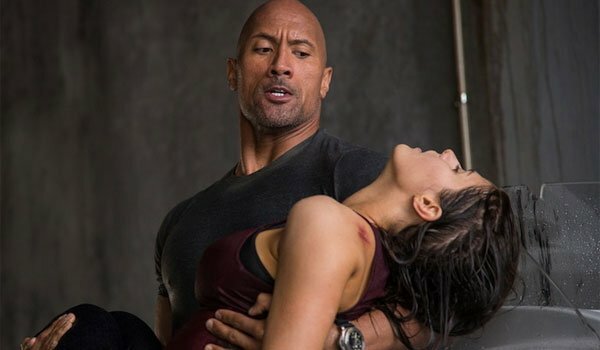 As you may have predicted from the fact that what I was seeing was an earthquake disaster film, far and away the most utilized and effective device used within the 4DX experience were the shaking, moving chairs that were synced up with all of the ground-rumbling and big action in San Andreas. While the shaking and the movement was never so intense that I felt I was going to be rocked out of my chair, the synchronization with the big moments on screen was fun, and I did feel like I was experiencing some of the same effects as the characters on the big screen. And not only would the chair shake and move, but massagers are built into the chair as well, occasionally throwing me into the action by slightly pushing me out of my seat. More than just basic rumbling during earthquake scenes, though, what I really loved was the way that the chairs interacted with the cinematography. Whenever director Brad Peyton used a sweeping aerial shot, the seat would slowly swivel – giving me the sense that I was flying with the camera. The best of all, however, was a moment where Dwayne Johnson’s helicopter began to spin out, causing my chair to start rotating in big 360 degree circles. The roller coaster effect of the seats was far and away the most significant aspect of my San Andreas 4DX experience, but I will also add that the environmental effects are a great deal of fun as well. In the aftermath of big on-screen quakes, fog and smell machines would produce smoke and scents of atmosphere, while scenes involving water actually produced a light mist in the theater (not nearly enough to actually make you feel wet, but enough to just feel it). What really threw me for a loop, though, was the surprising use of wind effects – utilized both during action scenes and during more calm moments set outdoors. Just feeling a breeze on my face did weirdly make me forget that I was inside a movie theater at times, and always felt natural – never like the air was being blown out of a hose into my face. When I first walked into the 4DX theater and took a look at the setup, my first thought was, This all must be super expensive. There are gimbals for rows of seating, special vents and hoses for the effects, electronics to turn on and off the water sprayers, and what are basically massage chairs for each guest. Surely it must cost a lot to fill a theater with this equipment, and I think this leads directly to the format’s biggest issue: the screen used for 4DX isn’t big enough. As much as I could appreciate the immersive qualities that come with the environmental factors of 4DX, the experience also did lack the same kind of awe-inspiring immersion that comes with truly big screen experiences. When I first saw Mission: Impossible – Ghost Protocol in IMAX, I was given actual feelings of vertigo, and felt like I was actually going to fall off of the Burj Khalifa. While there were shots in San Andreas that could have certainly inspired similar feelings on a gigantic screen, the projection in 4DX didn’t fill my field of vision, and I don’t necessarily get the sense that I got the full impact that would have come from being in a bigger theater. Ultimately, I could see the combination of 4DX and IMAX being an absolutely spectacular ride - as you could not only get vertigo, but also a chair actively trying to push you out of your seat. But filing an IMAX auditorium with this technology isn’t cost feasible yet, so we might have to wait a while for that to become a thing. Beyond just the big screen issue is also a touch of a "health" problem. While I never felt nauseous at all, the combination of the 3D, plus the moving seats, plus the smells/fog did give me the occasional headache during my San Andreas screening. I assume not everyone is going to have this problem or the same kind of sensitivity, but it was a part of my experience. So, should you seek out the 4DX experience for San Andreas? All in all, it’s a cool technology worth checking out, and while it’s hard to say if it’s the future of movie-going, it definitely presents an interesting potential avenue worth further exploration. Are You Interested In 4DX? Hell yeah, it sounds awesome!